It is neat and clean. 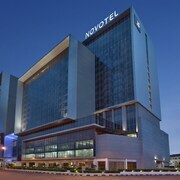 Shuttle bus to town centre is provided. Called the ‘Historical City’, Malacca is one of Malaysia’s most visited cities as it is rich in culture and history. 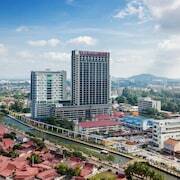 The city centre is a UNESCO World Heritage site, being one of the oldest cities in Malaysia. Malacca, or Melaka, is the centre of the Peranakan culture as well as the Portuguese Eurasian heritage. Both cultures have a noticable presence in Malacca, namely in architecture around the city and their unique food which is hard to find outside of Malacca and Singapore. The historical area is the most famous part of the city, with Dutch Square being one of the most popular tourist attractions. 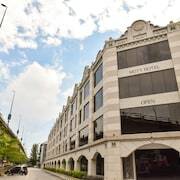 When choosing where to stay in Malacca, considering hotels close to the Dutch Square so you can easily explore the Stadthuys and Saint Paul's Church. Also in Melaka’s historical area are Cheng Hoon Teng Temple and Masjid Kampung Hulu. If you're on a family weekend getaway to Malacca, make a stop at the Malacca Zoo. The Melaka Zoo is arguably the best zoo in Malaysia, featuring over 200 species of reptiles, birds, mammals and amphibians that are enclosed in areas that resemble their natural habitat. The zoo also houses the endangered Sumatran rhinoceros, red panda, grey wolf, and plenty of other rare animals. The Maritime Museum is an interesting place, with its replica of Flor de la Mar, while St John's Hill and Fort is a great place to enjoy views of the city. 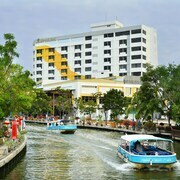 Ride in a boat along the Melaka River for a scenic tour. If you've filled your belly with Nonya kueh and Devil's Curry, take a relaxing stroll along the riverside. The Taming Sari Revolving Tower offers breath-taking views of the city, but only for those that aren’t afraid of heights. Otherwise, it is best to see the city from the double-decker Panorama Melaka bus. 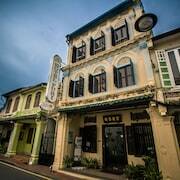 There are plenty of places to eat and drink in Melaka and a variety of cuisine to try. No one should leave without trying Peranakan food like ayam pongteh or ayam buah keluak, or Malay dishes like asam pedas and Ikan bakar. Jonker Walk is a good place to try local Malaccan food and drinks. 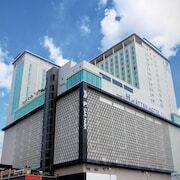 If you're a foodie, there are several Malacca hotels with good restaurants, serving some of the best local fare. 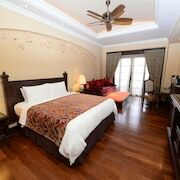 The Majestic Malacca is a great 5-star luxury hotel in Malacca with great local and colonial cuisine. Malacca is famous for its antiques. The weekend Jonker Walk Night Market is a great place to pick up bargain souvenirs and electronics, while the Dataran Pahlawan Malacca Megamall is the best place to shop for international brands.